A truly beach front villa.. walk out the garden and step onto the beach. 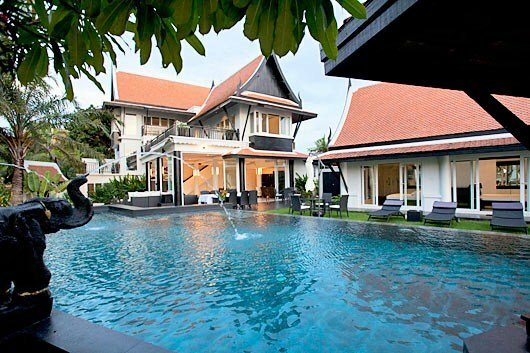 All villa's Thai style, this villa will amaze even the most sceptical with its sheer size and opulence. Bring your entire family to enjoy togetherness, and explore all the surrounding tourist attractions of Pattaya just 5 kilometres away, with Jomtien on the doorstep, and the outlying islands especially Koh Larn (Coral Island) within immediate grasp. A VILLA WITH PRIVATE POOL AND BEACH / SEA VIEW WE ALSO GIVE YOU A FREE MINI BUS WITH DRIVER FROM 09:00HOURS TO 18:00HOURS PER DAY. DOES NOT INCLUDE GASOLINE. A modern approach set in a traditional design has led to the creation of a villa to be the envy of all. On entering through the Thai-roofed entrance gate of Black Opal Villa in Pattaya, Thailand, you will gaze up at the huge roofs protecting this stunning villa: one on the sala in the pool, another over the garden chalet rooms of luxury hotel proportions, and the two of the main house set in a T-shape. All this whilst overlooking your own private pool, then the beach, then the warm waters of the Gulf of Thailand, and lastly the beautiful islands. A mature garden of palms and lawns around the level-deck pool can accommodate 15 seated for dining at tables, and a further 12 soft-seated or sun lounging. Shade or sun are available at all times of the day thanks to the trees, buildings, and electrically operated sunblinds. The main living room, being fully glazed on two sides offers splendid views both close and afar. Two extra-large leather sofas share a glass coffee table, and the dining area is simply a glass-topped table with eight leather-upholstered dining chairs, surrounded by large open floor areas complementing the design of the area. There is a games room with a dartboard, pool table, and a snug large-screen TV area with 4, yes 4 soft sofas and chairs. The main area also offers a guest's WC and there is a walk-in wine-cellar/larder to condition your finest wines and protect the choicest fare during your holiday period. There is no separate dining room as most eating can take place around the open and desirable dining table area, or in the beautiful garden; Your own private al fresco restaurant at your fingertips. The black themed large kitchen area has every modern appliance including dishwasher, microwave, gas wok-burners with a space-age extractor fan, island preparation unit, in fact every modern and up-market appliance including the TV. Although guests can cook, you are not expected to, as Wad the housekeeper will do everything for you: Buy the food, prepare any number of meals, and clear and clean (even if you have cooked). She charges a modest fee for each meal she prepares e.g. maximum 1000 baht for breakfast, or lunch, or dinner irrespective of the number of guests served. Therefore, breakfast for 12 is 1000 baht. There are two bedrooms in the garden chalet; one of which opens directly onto the beach when the automatic gates are open. These close at night for added security. There is also lounge seating in this room. Both rooms are fully appointed, with clear screen shower rooms. Back in the main house there is a downstairs bedroom off the games room with its own patio door and pebble garden. Up one flight of stairs from the living area takes us to a bedroom suite on a mezzanine level. This is most luxurious with its own patio doors to a balcony overlooking the pool and sea beyond. Every bedroom has a flat screen TV and DVD, black granite basins and clear-screen showers. This suite also has a matching, granite 1m-deep bath. Up another half level brings us to another bedroom, offering spectacular sea views with its own large balcony with lounge style seating and more views. Moving to the top-floor, there is a further suite with magnificent views, a small balcony, walk-in wardrobe, and ante-room large glass-roofed WC room. Every one of the 12 guests can feel like royalty. All the bathrooms are ensuite with the bedrooms and mostly feature large multi-person clear screen showers. All the WCs in the bathrooms have modesty doors. A thoroughly modern approach to the bathroom design compliments the feeling of well-being whilst staying at this most luxurious villa.